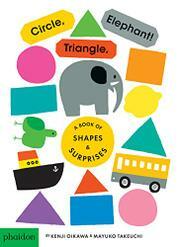 A deceptively simple primer on shapes becomes a spot-the-difference game. The first double-page spread looks elementary enough. On verso, a red triangle sits atop a pink circle, which balances on a blue square; the text reads “triangle / circle / square.” On recto, a large pink circle rests on a blocky, orange rectangle, which teeters on the point of a purple triangle: “circle / rectangle / triangle.” But with the turn of the page, readers see, “triangle / elephant?! / circle” on verso and “elephant / elephant / rectangle” on recto; the layout is identical to the first spread, with the three shapes or objects presented in vertical towers. It gets even sillier as pages turn, with the introduction of a “boat!” and then three more; a smiling “face!” (another appears to be somber); and then lemons, buses, birds, black hats, and a fish. Each time a new variable is introduced, it is italicized and exclamation-punctuated, prompting animated reads. The pacing ensures that no new element appears too quickly for little readers to assimilate it, and the relatively high page count facilitates their joining in the game by the end. All the elements appear to be hand-drawn, with comfortably fuzzy edges, and they are all laid out on white space for maximum discernibility. The objects that are not shapes are represented elementally and consistently enough that little ones should be able to spot them with ease.